I am posting this, not because I knew how to find even ground after the loss of my mother, but to share my 20/20 hindsight and learnings. Let’s start with what I learned about equanimity. If you prefer to listen, click here. Equanimity is not a static state. It takes effort and attention to stay in balance. Dig the well before you are thirsty. It is too late to start practicing mindfulness when you are grieving. Resource yourself. Gather strength from nature, loving kindness practice or just being compassionate with yourself. Grief is not one emotion. It is made up of lots of emotions, regrets, memories, wishes, clinging, and fears. Listen to your body so you can catch the emotion before it hardens into grasping or aversion. Equanimity is all about letting go of trying to control what cannot be controlled. Hold your grief gently and let it go. Over the past few months, I thought I was failing on equanimity as I continued to have ups and downs. Recently I learned that equanimity is not a static state. You don’t get to a place of balance and stay there. The metaphor DaRa Williams uses is a seesaw. When you were a kid and tried to balance on a seesaw with your friend, you didn’t just move to one place and stay there. Staying balanced required constant movement. It took effort and attention to stay in balance. We live our lives bouncing back and forth between pain and pleasure, gain and loss, fame and disrepute, praise and blame often without knowing what is going on. And thus, aversion and greed arise because we are pushing away the pain, loss, disrepute and blame while trying to hold on to the pleasure, gain, fame and praise. Grief drains your energy. But you add to the exhaustion by trying to push away the pain of loss. I had very little energy after the death of my mother. Since I had been grieving her loss for the two years that she had dementia, I thought I “should be” done with grieving. So, I just tried to go on with my everyday life. And for me a habit energy is sweeping unpleasant under the carpet. I thought I was doing pretty good. My plan was to deal with any left-over grief at the retreat I was going on, and to be done with it before Walt and I went on vacation. About a week later, I went to the silent retreat. The first day I was able to settle into the meditation. The grief was not rearing its ugly head. At least not until the evening when we did a lovingkindness meditation. Then my heart broke open and the pain was overwhelming. I was sitting at the meditation holding my breath trying to hold the grief in so I would not disturb everyone else. They were doing a very beautiful lovingkindness meditation. I felt panicked until I remembered I could go back to my breath. Usually I use my chest as an anchor for my breath. But it was too contracted. Instead, I used the sensation of the breath in my nostrils. Thay is right when he says, “When we recognize and embrace the pain and sorrow within us, it calms down like the baby in her mother’s arms.” It really did calm my panic. And I realized that in that moment, even though my grief was strong, I was OK. I could be with the grief, mainly because I knew I would be OK by coming back to my breath. It was my years of practice that allowed me to take refuge in my breath. The grief arose, was there for a while, went away. I only had to be with it in that moment. Don’t get me wrong, it came back over and over, but each time it passed away. And if it got too strong, I could go back to my breath. That night I could not sleep. I was totally aware of every sensation in my body. Rather than just being with it, I breathed through it to try to push it away. I was supposed to be sleeping. How was I going to meditate the next day if I didn’t sleep? I scheduled an interview with one of the teachers. The advice was to go easy on myself. I did not have to deal with all of the grief at the retreat. She also suggested that I just walk outside during the walking meditation. I walked on the frozen lake during the next walking meditation. I found I could enjoy the sun shining on the snow. I could gather strength by taking in all the beauty of nature. As I calmed, I started thinking about “my” grief. I realized that grief is not a single emotion. When you look underneath, it is filled with lots of little feelings, like regrets, sorrows, clinging to moments of the past, and fears. Grief also brings up other unresolved griefs, so grief for my dad had arisen as well. I realized that I could deal with one piece of the grief at a time. I did not have to fear being overwhelmed. I began developing a list in my head of all the griefs that I needed to deal with. The project manager in me thought about making a checklist and dealing with them one at a time. Luckily, I realized that would be over-efforting, and was just my need to control showing through. Instead I needed to just deal with each grief as it came up, whether it was during sitting meditation, walking meditation or even when I was “supposed” to be sleeping. The next sit, I had lots of aches and pains. I remembered Jonathon Faust, the movement teacher in my meditation teacher program, saying, “The issues are in your tissues.” As I sat, I focused in on one of the pains. I used the question that my meditation teacher friend Leah always asked me, “Can you be with this?” As I sat with the pain, a sorrow came up. Again, I asked myself, can you be with this? And I sat with the sorrow. Once the sorrow was not so strong, the pain actually went away. Thus, I could focus on another one. That evening was another lovingkindness meditation. I considered skipping it as I did not know if I could handle it. Instead, I sat in the back so I could leave quietly if I needed to. I used my daughter as my benefactor. I could feel her love for me and my mom. That gave me the strength to do the loving kindness meditation. Subsequent nights, I used Walt and my boys to give me strength. The last night, I was able to send loving kindness to both my mom and my dad. One of my griefs was not being able to tell my mom and dad I loved them anymore. With metta practice, I can send them love and my wish for their well-being wherever they are. The words that worked for me were: May you be filled with loving kindness. May you be free. May you be peaceful and at ease. May you be happy. This also took some strength away from the fear that keeps arising because I don’t know what happens when people die. Throughout the retreat I resourced myself by walking in nature during the walking meditation, lunch and dinner times. The daily hug from Walt and just knowing he was there also gave me strength. That allowed me the strength to sit with whatever came up. I also asked myself what story I was telling myself. By answering Thich Nhat Hanh’s question, “Are you sure?” I learned that although the stories felt very real, they were not necessarily true. Equanimity is what allows us to see widely, with spacious balance. It allows us to rest the mind before it falls into extremes. That wisdom allowed me to turn the volume down on those thoughts and move more evenly with life as it came. The near enemy of equanimity is indifference or callousness. We may appear serene if we say as I did, “I am fine. I’ve dealt with my grief.” Jack Kornfield says we may feel a certain peaceful relief because we withdraw from experience and from the energies of life. But my indifference was based on fear that the grief would never end. Right after my mom died, I thought I should be done with my grief, so I withdrew from it. True equanimity is not a withdrawal; it is a balanced engagement with all aspects of life. It is opening to the whole of life with composure and ease of mind, accepting the beautiful and terrifying nature of all things. Equanimity eliminates clinging and aversion. With equanimity, we see what we genuinely cannot control, no matter how obsessed we might become with trying to. 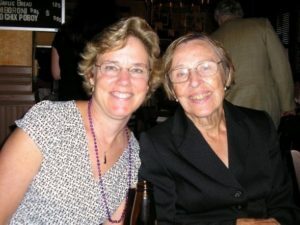 Intellectually, I knew I could not control my mother’s advancing dementia, nor her death. In my heart I wanted to fix it for her. The more surprising control issue was that I could not control my grief. I could not create a timeline for dealing with it. It could raise its head at any time without notice. Equanimity is the ability to see without being caught by what we see; a calm presence that is aware, open, engaged but not swayed or caught by any phenomena, any experience of the moment. In her book Comfortable with Uncertainty, Tibetan teacher Pema Chodron said, “To cultivate equanimity we practice catching ourselves when we feel attraction or aversion before it hardens into grasping or negativity.” For me the way to catch myself was to listen to my body. Instead of my body saying I am agitated, and my mind saying just get busy; I needed to sit with my agitation so see what was underneath of it. In early April I felt like I was back to myself. But in late April my sits became very restless. And throughout the day I felt somewhat agitated. I was resisting grief again. At prison, one of the women was talking about how supportive her mother was, and how agitated she was feeling. Then she said Mother’s Day is coming up and I will not be able to be with my mom. That was a bell of mindfulness for me. No wonder I was feeling agitated. I was resisting reality. I was very anxious because I thought Mother’s Day was going to be very difficult. In reality, I got to help my granddaughters give their mother breakfast in bed. And then I drove to Minneapolis to be with my son and his family. While I missed my mom, the stories I was telling myself about how hard it would be were totally exaggerated. They felt real, but they were not true. Equanimity, in its most basic understanding, is all about “letting go”. “Of what?” you may ask. The Buddha would answer trying to control what cannot be controlled including all the inevitable changes that are a part of life. In letting go of the grief through acceptance of what is, we realize contentment. There is a baseline of equilibrium in body: we’re not disturbed, and we’re not zoned out to avoid being disturbed. It is only when we come home to the present moment that we find the inner sanctuary of peace. Look under Guided Meditations for an Equanimity Meditation. This is beautiful and deeply touching. I really appreciate the insight on grief and how we resist being with it as well as the recognition of the rhythm of equanimity. It is such a great reminder to keep checking in with ourselves. Thank you for sharing, your teaching is very clear. I especially related to the project manager in you wanting to make a checklist of griefs to deal with. So up my alley. I also love the way you present equanimity – as an ongoing balancing act. That makes me feel better because sometimes I don’t stay balanced but have to consciously work at regaining balance.